Call Center agents with years of experience, training and skills have a greater need to see metrics and statistics that will assist them in improving their performance. Unlike new agents (See my January 2012 article - New Agent Metrics) senior level agents look to their metrics to improve their performance because they are aware of the status in the call center. Senior level agents know when there are calls in the queue and do a fine job of reacting to long wait times. Showing a senior level agent status metrics is a waste of desktop real estate. Advanced agents require metrics and statistics that will guide them towards a higher level of performance. 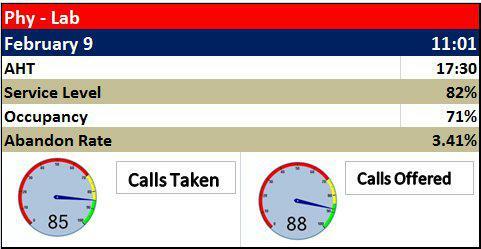 Calls in Queue - Agents still need to be alerted to calls in queue. These metric are recommended for the skilled and experienced agents. Too often call centers display the same metrics and statistics to all agents regardless of the agents skills, experience or even the groups they are assigned to. If the call center manager truly wants to improve performance in the call center then the metrics must match the agents skill levels. Even among senior level agents there are varying degrees of skills. The manager should work to ascertain the most appropriate metric for the agents. Some higher level agents require gentle reminders about wait times and ASA. Other agents track their service level, CSat and FCR ratings so they can share in the monthly bonus program. 3. Determine what the agent needs to work on to improve. These three things will assist you in determining what the agent should see on their desktop display. There are two major mistakes that most call center managers make when it comes to desktop solutions. These mistakes are easily corrected but take a little time. Therefore it is best to make these changes during the agent performance review. The two mistakes are: considering all agents to be the same skill level as it relates to the desktop information they see and not adjusting the desktop content as the agents performance has improved. Messaging to a senior level agent is no longer just the congratulation message but also messages asking for help. Managers that recognize that not all agents are created equal and change the agent content will see improvements within the call center immediately.